Icarus is a famous figure, all be it a minor one, from Greek mythology, and the story of the boy who flew too close to the sun is one which is still told, and retold, today. Today, the story of Icarus is often used as a warning that people should be aware of the dangers of overconfidence and recklessness. The story of Icarus in Greek mythology appears in various ancient sources, although the Bibliotheca (Pseudo-Apollodorus) does provide some details missing from other sources. The story of Icarus from Greek mythology begins upon the island of Crete, for Icarus is the son of Daedalus, the legendary craftsman and inventor. Daedalus had arrived upon Crete many years previously, having been exiled from Athens, and had subsequently found a generous benefactor in the form of King Minos. Daedalus had worked hard for King Minos, and had achieved a relatively high position, for a servant, within the royal court. As a reward for this work, Daedalus had been allowed to partner with one of Minos’ beautiful slave girls, a woman named as Naucrate in the Bibliotheca. From this relationship came forth a son, a boy named Icarus. The fall from grace for Daedalus, and the downfall of King Minos, was to follow several years later, for the Athenian hero Theseus was destined to arrive upon Crete. Theseus was due to be one of the Athenian youths scheduled to be sacrificed to the Minotaur as part of the tribute paid to King Minos by Athens. Ariadne, the daughter of King Minos, though, had spied Theseus as he arrived upon the island, and had fallen in love with the Greek hero. To aide Theseus, Ariadne had enlisted the help of Daedalus, the man who had designed the Labyrinth beneath the palace at Knossos, and so Theseus entered the domain of the Minotaur with a ball of twine and a sword. Theseus was thus able to slay the Minotaur, and soon the Greek hero and Ariadne were fleeing from Crete. Initially though, King Minos was more angry about the help given by Daedalus than he was about the intrigue of his own daughter Ariadne. 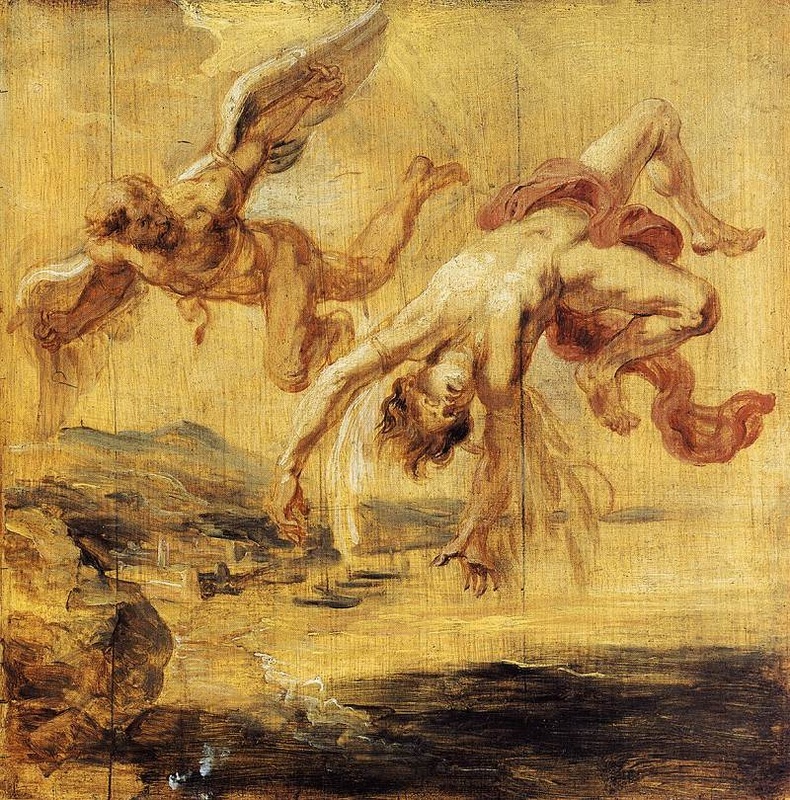 Minos though did not want to lose the services of the master craftsman, and so rather than being executed, Daedalus and Icarus were instead locked away in a tall tower (or in other sources father and son were locked within the Labyrinth). No prison would keep an inventor like Daedalus locked up, but Daedalus realised that he and Icarus need not to just escape their prison but they needed to leave Crete as well. Sailing away from Crete would appear to be the most likely solution, but the Cretan navy of King Minos comprised the quickest vessels of the age. 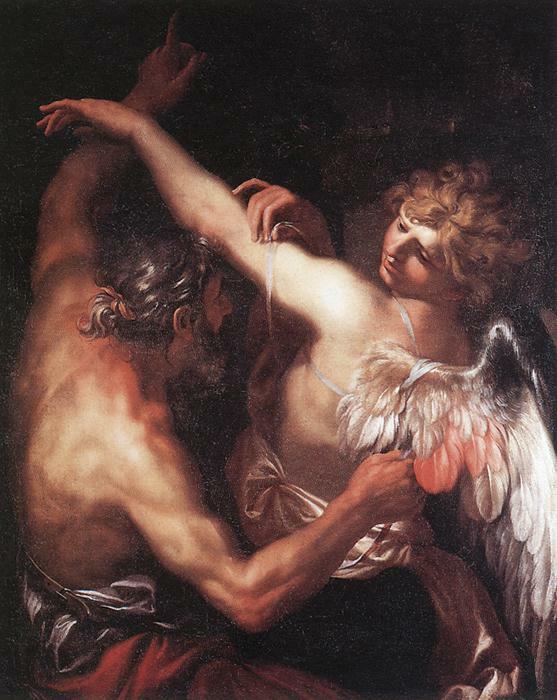 Daedalus decided that he and Icarus must fly away. Of course manned flight had never been undertaken before, and so Daedalus had to invent a method of flying. The plan was simplicity itself, for he had Icarus gather together all of the shed feathers that were to be found in their prison, then with wax, Daedalus glued the amassed feathers to wooden frames, and soon two sets of wings had been manufactured. Daedalus realised that the wings he had manufactured had many weaknesses, and so pre-warned Icarus about the dangers of flying too high, or indeed flying too low. Too high would see the wax being used as glue melt, whilst too low, would see the seawater impregnating the feathers and wood, making the wings too heavy to fly. The day arrived when Icarus and Daedalus would escape from Crete, and the pair leapt from a ledge together, flapping the manufactured wings as they did so; thus man’s first flight was undertaken just as the birds did. The escape was successful, and undetected, and soon through a mixture of wing flapping and gliding, Daedalus and Icarus had left Crete far behind. 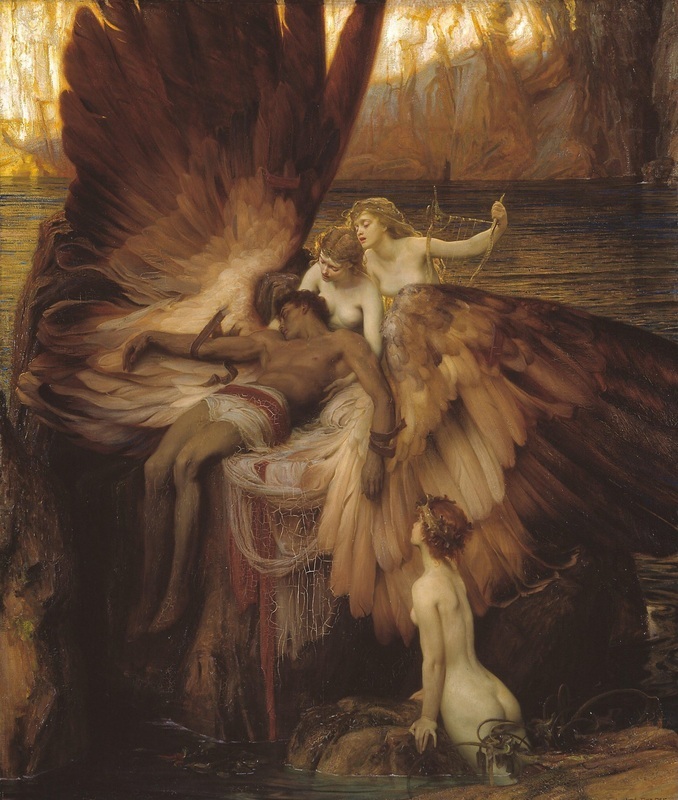 Many miles were soon put between King Minos and the escaping pair, but as Icarus and his father approached the island of Samos, disaster struck. Icarus had become over confident, and ignoring the warnings previously given by Daedalus, he started to fly higher and higher. The worst fears of Daedalus were soon realised for as Icarus flew closer to the sun, the wax began to melt, and the feathers soon became detached from the wooden frame. In a very short time, all that Icarus was left clinging onto were the wooden frames, and so Icarus plunged seawards, dying as he hit the water. The area of water where Icarus hit would become known as the Icarian Sea, whilst the previously unnamed island where the body of Icarus washed up was subsequently called Icaria. Daedalus of course had to watch his son fall to his death with no way of intervening, the grieving Daedalus would have to fly on alone to safety. Some sources though claim that the Greek hero Heracles had witnessed the death of Icarus, and recognising the boy as the son of Daedalus, Heracles was said to have performed the necessary funeral rites which Icarus’ father had been unable to do. Back on Crete the escape of Icarus and Daedalus which had gone unnoticed was eventually discovered, and Minos would set out with his fleet to recover Daedalus, for the king of Crete did not want the craftsman working for anyone else. The flight of Daedalus and Icarus though had left no clue as to direction travelled, and so King Minos was in for a long search.